The Brooklyn College Garden unites campus and neighborhood communities in the interest of building a sustainable future. 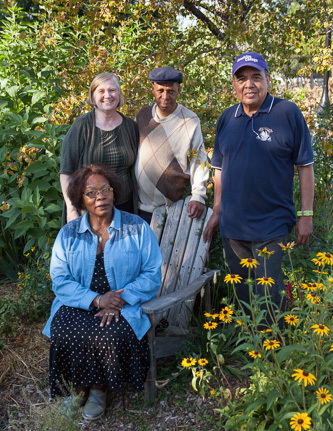 Greenthumbs in the green space: Rosita Azuma (seated), Professor Louise Hainline, Officer Tafari Sherry, and Pablo Garcia. Professor Louise Hainline is not afraid to get her hands dirty. A professor in the Brooklyn College Department of Psychology as well as the director of the Minority Access to Research Careers (MARC) and Research Initiative for Scientific Enhancement (RISE) programs, Hainline is also director of the Brooklyn College Garden, and has kept herself busy directing how best to use it. "As per our mandate from Brooklyn College President Karen L. Gould, we are committed to sustainability in all its aspects," she said. "I also believe that as an educational institution, we have an ethical obligation to teach best practices for healthy urban living though the creation of green spaces." The Brooklyn College Garden—previously known as the Campus Road Garden—was founded in 1997 as a 1,700-square-foot parcel of land, a temporary space that the college offered to a group of neighborhood gardeners who had lost access to their own community garden. The garden has gone through several changes since then, including some that required the accommodation of the college's new athletic field. After sometimes tense negotiations between the college and gardeners, the space was revitalized and renamed, and now occupies more than 4,000 square feet of land on the western edge of the campus, behind the West Quad Center and the athletic field. It was a win-win situation for all involved. "The new athletic field was configured in a way that allowed women's sports to take place that hadn't been able to be done on Brooklyn College campus before," Hainline added. "And the gardeners got a new space that the college has invested in by providing some funding." 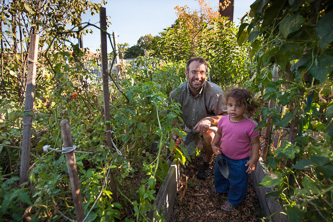 Gardener Murray Lantner and his one-year-old daughter, Meitar, enjoy shoveling, planting, and reaping the garden's rewards. It is a space where, for a $30 annual fee, gardeners can grow food in single or shared raised beds, some of which were designed to give access to gardeners who are disabled or have limited mobility. Volunteers, under the guidance of college-sponsored, professional gardener Sigrun Saphire, help maintain the garden by collecting and distributing compost materials. All funds, including those provided by the college and those raised via crowdsourcing, are used for improvements, such as the purchase of materials used to construct the new three-bin composting system built by Brooklyn College carpenters Tom Doherty and Tom Mollaghan, the new irrigation system, and new outdoor furniture. Murray Lantner, one of the neighboring gardeners, bikes over with his wife and young daughters to plant as well as to learn and play. "The kids learn a lot about where food comes from, what the different flowers and plants look like, and the animal and insect life that make up the garden's ecosystem. My wife and I greatly value this garden and we feel very lucky to be a part of it." The college also recognizes the myriad of benefits the garden provides. "Some of our health and nutrition instructors use the garden for their classes, and students take advantage of composting throughout the year," Hainline said. "President Gould's hope for the garden is that it serve the community as well as be integrated into our academically linked objectives." Officer Tafari Sherry, from the college's Office of Campus and Community Safety, thinks of himself as the unofficial watchman of the garden and has a personal stake in its security. He's maintains a small plot of land where he's been growing hot peppers, cucumbers, and tomatoes every year since 2011. "Because I'm stationed so close to the garden, I can help keep an eye on it as a part of my regular duties. And after work, I can tend to my vegetables," he said. For others, the garden serves an opportunity for civic engagement. "It has become necessary for every citizen to understand the ecological science that affects their neighborhood," said Pablo Garcia, a Brooklyn College graduate student in the college's general science teacher program, who volunteers in the garden. "So that they can tell their elected representatives, 'This is what we consider a priority for our homes and streets, and this is what we want our city agencies to be held responsible for.'" Brooklyn College neighbor Rosita Azuma has participated in various incarnations of the garden for the past 23 years. The Costa Rican native is looking forward to winter gardening for the first time. "It's the economical and healthy choice," she said. Professor Louise Hainline and student Pablo Garcia discuss the history, benefits, and communal experience of the Brooklyn College Garden. One of the most important parts of the Brooklyn College Garden, many believe, is its ability to build community at the college and in the surrounding neighborhood. Faculty, neighbors, staff, and students from all backgrounds are united in the interest of education, health, and sustainable living. Hainline comes from a family of gardeners who did so out of economic necessity, giving her a keen understanding of what the garden represents. "It is a space on campus where all gardeners from all groups are on equal footing," she added. Hainline and company have grand plans for the future of the garden. They will be forming an official garden committee that includes members of both the campus and neighboring communities. They plan to add more edible and medicinal herbs, as well as drought-tolerant and wildlife-friendly flowers, grasses, and shrubs. They will be constructing a rainwater collection system to ensure the best conservation of water. They will also be installing a solar panel to provide electricity to the garden's shed. The garden is officially registered with the New York City Department of Parks and Recreation's GreenThumb program, which provides support to local community gardens.